Another week, another Marvel movie! 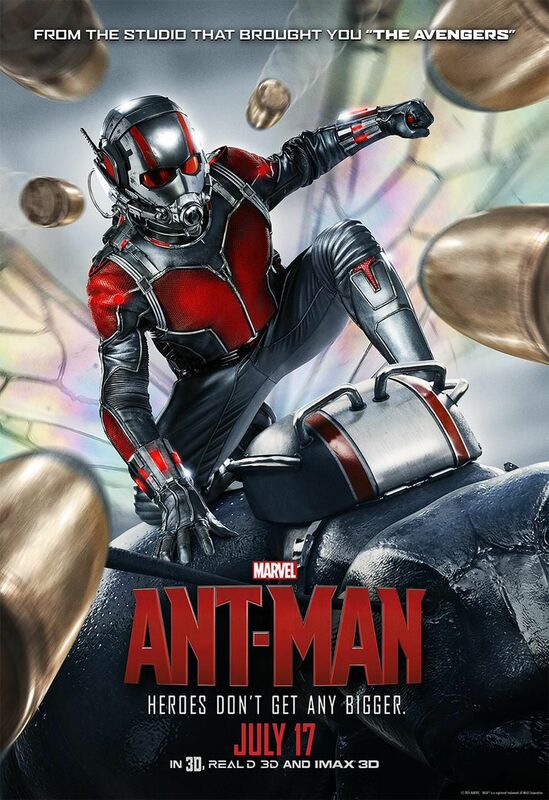 Today's film, ANT-MAN (2015), marked the fifth Marvel film I've seen since Independence Day. I enjoyed it very much. 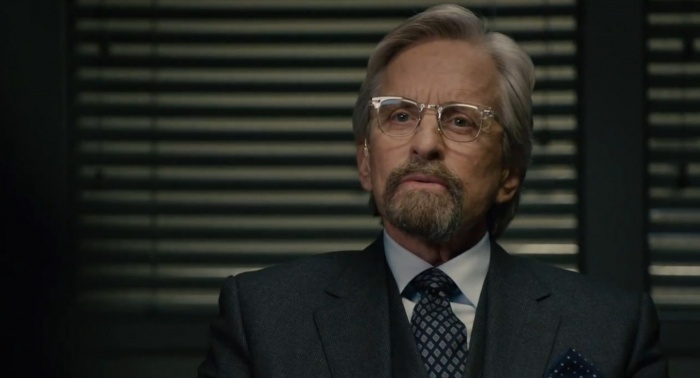 ANT-MAN begins with a brief prologue set in 1989, as Dr. Hank Pym (a digitally "de-aged" Michael Douglas) visits SHIELD headquarters. I'd seen just enough of the Marvel universe in previous films to understand that Pym was arguing with an "older" Howard Stark (John Slattery) and Peggy Carter (Hayley Atwell) about his secret formula, which Pym says would be dangerous even in the hands of the "good guys." (Hayley Atwell has played Peggy at three different ages so far in the Marvel series, and she's been believable at each step.) The film then zooms forward to the present day, where Pym's fears are realized as his protege Darren Cross (Corey Stoll) now has the formula...which enables men to shrink to the size of an ant. Dr. Pym selects Scott Lang (Paul Rudd), who was recently released from San Quentin for burglary, as the perfect man to use his formula to become "Ant-Man" and beat Darren at his own game. 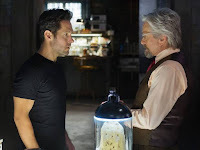 Dr. Pym and his daughter Hope (Evangeline Lilly), who have a conflicted relationship, painstakingly train Scott in the use of an "ant man" suit; Scott also gets over being creeped out when surrounded by ants, befriending them and marshaling them into an army. Then it's time to head into battle, as Darren has sold his formula to the bad guys at HYDRA. 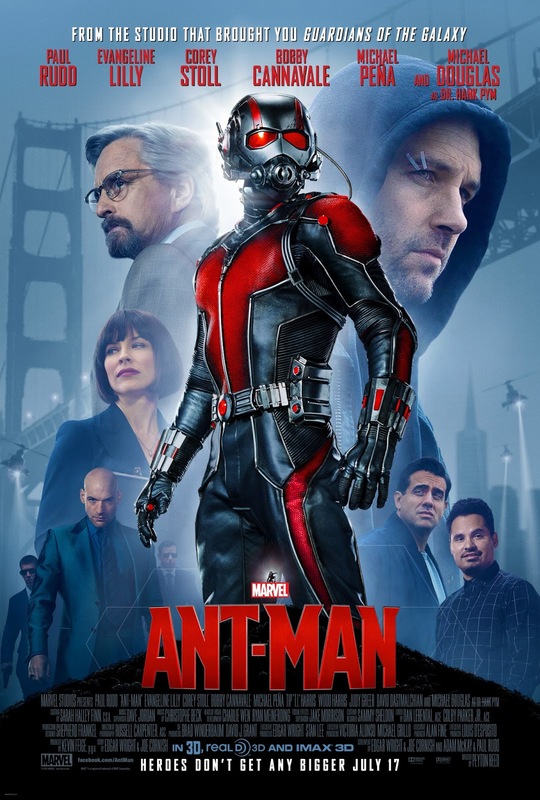 ANT-MAN is an engaging film which works on multiple levels: superhero film, OCEAN'S 11 style heist movie, comedy, and a touching relationship film about fathers and daughters. While Dr. Pym and Hope are working through their issues, which date from the disappearance of Hope's mother, Scott wants to find a way back into the life of his little girl Cassie (Abby Ryder Fortson). One of the film's more amusing aspects is that Scott's burglar friends who support his mission are quite nice -- only in the movies! -- with one of the funniest moments in the film being when Scott's former cellmate (Michael Pena) asks with astonishment, "Are we the good guys?!" Other fun moments include Ant-Man's confrontation with befuddled Avenger Sam Wilson (Anthony Mackie), aka "The Falcon," who gasps that Captain America had better not hear about his humbling experience, and some hilarious sight gags with Thomas the Tank Engine in the film's final moments. Smiling Thomas looks pretty scary when you're the size of an ant! I'm not the world's biggest Michael Douglas fan, but I must say he was perfectly cast in the role and brings a lot to the movie. He was an excellent choice, simultaneously capturing his character's loneliness, intelligence, sarcastic arrogance, and nobility. Rudd believably makes the jump from loser to brave hero, and while Lilly initially seems on the chilly side, it's in character; wait till you see her eyes flash when she sees... Well, you have to sit through the end credits. And don't leave until the VERY end of the credits as there are not one but two important "tags," as well as the info "ANT-MAN WILL RETURN." One of the other things I liked was that the movie avoided cliches regarding Paxton (Bobby Cannavale), the man who plans to marry Scott's ex (Judy Greer) and be little Cassie's stepfather. It would have been easy to go the SAN ANDREAS (2015) route and have Paxton turn out to be a bad guy, but as the story develops, he's simply a cop with clear ideas about right and wrong, and Scott, being an ex-con, has been wrong. When it comes to Cassie, Paxton clearly loves her (filming her first cartwheel on his phone is a nice touch), and he's right there to put his life on the line for her alongside her father. I noted multiple Disney connections in IRON MAN 2 (2010), including a brand-new Richard Sherman song modeled on the 1964 World's Fair tune he wrote with brother Robert, "It's a Great Big Beautiful Tomorrow." The Sherman Brothers' World's Fair music reappears in ANT-MAN, this time with a character whistling "It's a Small World" during the climactic action sequence. I'll be curious to see if the filmmakers keep that thread going and drop bits of Sherman music into future films. Trivia: When I first heard the lead actor was named Paul Rudd, I was a bit confused, as the Paul Rudd I knew was a TV actor of the '70s and '80s. That actor died in 2010 at the age of 70. 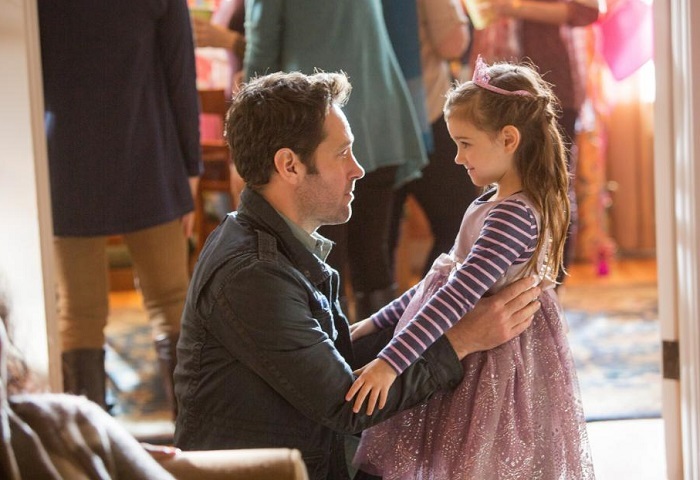 The Paul Rudd who stars in ANT-MAN was billed as Paul Stephen Rudd early in his career because of the name issue. 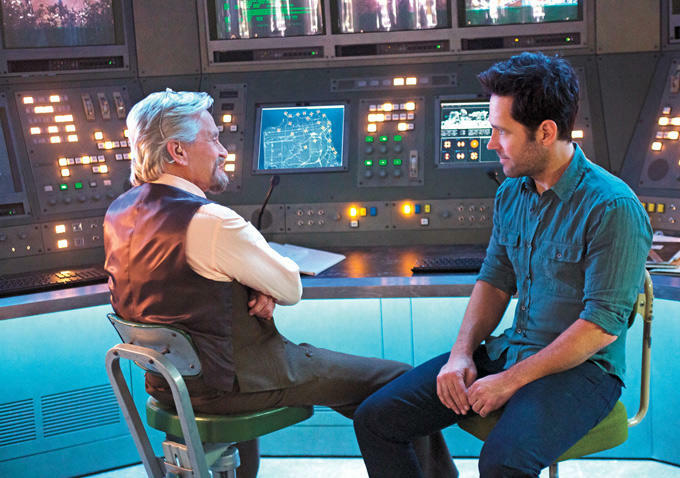 ANT-MAN was directed by Peyton Reed and filmed by Russell Carpenter. It runs 117 minutes. Parental Advisory: This film is rated PG-13 for sci-fi action violence. Someone being "vaporized" and a child briefly in danger are as bad as it gets, and for the most part the little girl seems more fascinated than scared. For two more "thumbs up" takes on ANT-MAN, please visit reviews by Kenneth Turan in the Los Angeles Times and by Leonard Maltin. The trailer is here. ANT-MAN provided another enjoyable visit to the Marvel world. Recommended. Previous Marvel reviews: CAPTAIN AMERICA: THE FIRST AVENGER (2011), CAPTAIN AMERICA: THE WINTER SOLDIER (2014), IRON MAN (2008), IRON MAN 2 (2010), and AGENT CARTER (2015). Thank you for a great review. I did see the preview in the Bug's Life Theater at DCA and though I enjoyed that I was still on the fence about seeing this movie. But now I think I will pull it together and go out to see this in the theater rather than waiting for the DVD. Also, thanks to you, I had missed seeing Iron Man 2. Not sure why but I got the DVD from the library and like the other two Iron Man films really enjoyed it. I loved the Disney connection/World's Fair connection. So glad you enjoyed it, and I hope you enjoy the movie! I suspect you'll enjoy it as I did - either way, do let me know! So glad I was able to encourage you to catch IRON MAN 2 which was also very enjoyable. :) Thanks for letting me know!